I have always been a big fan of the Child’s Play movies. My son Lucas is 22 months old and the PERFECT size to be a real life version of CHUCKY! 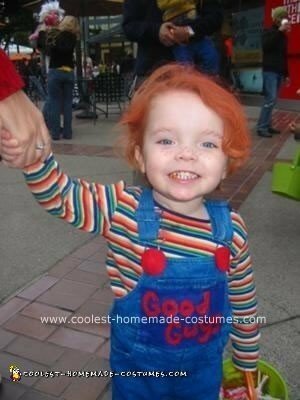 This homemade Chucky Halloween costume idea was pretty easy. I found some overalls at a thrift store and spray painted them blue and added the “Good Guys” logo on the front with red felt and super glue. I also used the red felt to create some large red buttons. I found a colorful striped shirt and some red tennis shoes (not pictured) at the thrift store as well. For his red hair I used Bumble and Bumble’s red hair powder – you just spray it in and it washes right out. I used a brown marker to draw on freckles and his little eyebrows. He also carried around a fake butcher’s knife, which isn’t in the photo, but it really added to the creepiness. Everyone who saw him loved his costume! He looked so cute yet so creepy at the same time! I think this one will be hard to top next year. I can’t find a shirt like that anywhere!!! Wanna sell the costume? Good job on it! also don’t know where to find that striped shirt .. I can’t find the striped shirt, so I’ll just paint yellow and red stripes on a blue shirt.